About a year ago my mom introduced me to a lovely shopping venue called Room with a Past. Room with a Past is open four days a month and is a consignment-ish shop. 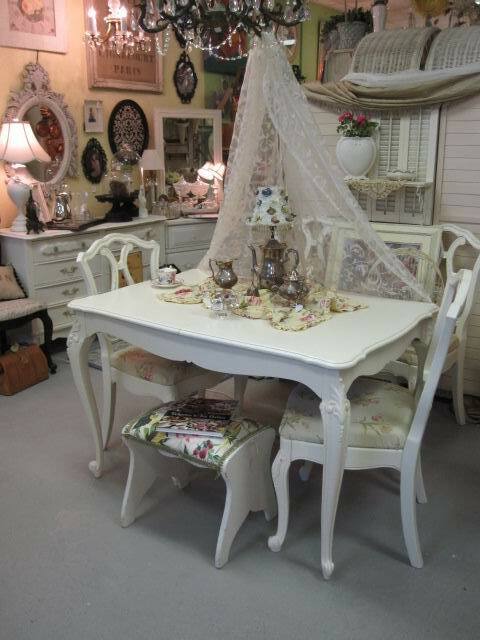 The ladies running the show specialize in antiques, vintage items and all things shabby chic. Needless to say, I visit the Room almost every month to do a little treasure hunting. I usually don't need anything, but I love to look at the beautiful displays and get ideas for my own home. Here are a couple of the lovely items I picked up last month. I bough this bird feeder because I love the shape and style. Nick and I have been discussing how we want to fix up our little outdoor space and maybe this bird feeder is the perfect item to jump start out sprucing up! These little terra cotta pots and wire basket were calling my name. They would look lovely with some small (hearty!) plants. Lastly, I picked up this petite ceramic bowl, thinking it would perfect for corralling small items that tend to get lost around our home. If you live in the Bay Area, you should most definitely visit Room with a Past. It's the perfect girly store to get your fill of shabby chic! Did you enjoy this post? Leave a comment below and let us know what you thought!